The island of Kauai, also known as the 'Garden Island', is the fourth largest island in Hawaii. It is also the oldest and the northernmost. It is divided into four parts: North Shore, South Shore, West Shore and East Shore. It is especially famous for the Na Pali Coast, one of the most beautiful coastlines in the world and the Waimea Canyon, also known as the 'Grand Canyon of the Pacific'. I was in Kauai for six days this summer and was staying at the Hilton Garden Inn in Kapaa (East Shore) located on the Wailua Bay. I was traveling solo all the way from India and before leaving, had signed up for two activities in Kauai-a helicopter tour and a photography workshop with Kauai Photo Workshops (www.kauaiphotoworkshops.com). I did not rent a car and instead took the help of an Uber driver who showed me around the island, including all the important sightseeing spots on the North Shore. Together with my other two activities, I was able to see and experience most of the island in the few days I was there. Here is my list of the top 20 most amazing things to do in Kauai. Please note, that I have missed the famous Secret Falls since they are very crowded and not a secret anymore, the boat trip to Fern Grotto as there is not much left to see at the grotto these days and the dangerous Queen's Bath which is not a safe spot for swimming. From the following list, you can do the helicopter tour on Day 1, photograph the sunrise at Secret Beach, swim or snorkel at the Anini Beach and stop at the Kilauea Lighthouse on Day 2, take pictures in the Tree Tunnel, visit the Kauai Coffee Company, check out the Waimea Canyon Lookout and the Kalalau Lookout on Day 3, hike the Kalalau Trail and swim at the Ke'e Beach on Day 4, visit the Wailua Falls and the Wailua Lake on Day 5, and do the Loop Road and the Opaeka'a Falls on Day 6. If you are a beginner in snorkeling, try the Lydgate Beach State Park, and if you want to do some night photography of the Milky Way, Hanalei Pier is a great spot! Helicopter tours are perhaps the number one activity on the island of Kauai. Almost 80% of Kauai comprises of inaccessible terrain and private property making helicopter tours very important. The tours take you to the very interior of the island and show you so much of Kauai that you cannot see any other way. I booked a 60-65 minutes doors-off helicopter tour with Jack Harter Helicopters. I was able to see a lot of Kauai including the Waimea Canyon, the Na Pali Coast, the Jurassic Park Waterfalls, the Olokele Canyon, the North Shore beaches from Ke'e to Hanalei and the Wailua Falls. Check out my full post on Doors-Off Helicopter Tour with Jack Harter Helicopters. Na Pali Coast is one of the most beautiful and pristine coastlines in the world. Na Pali in Hawaiin means many cliffs so the Na Pali Coast is a coast of many many cliffs. 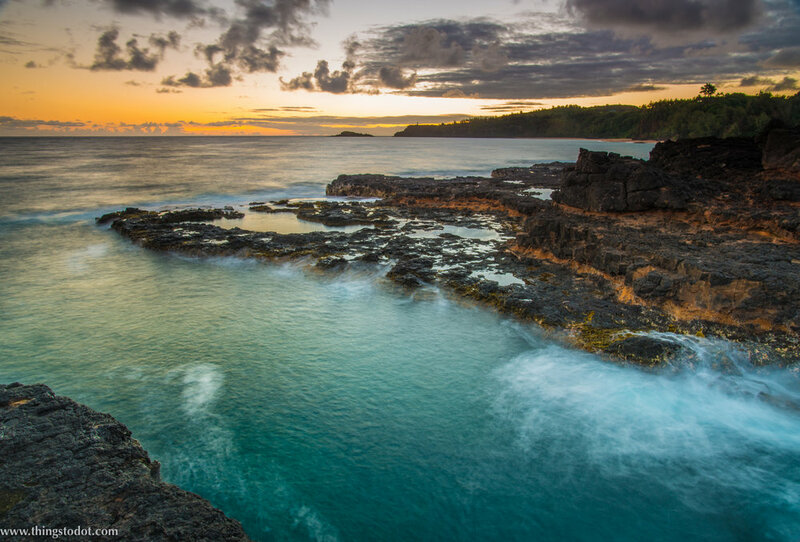 It is a 19 mile stretch of rugged coastline on the northwest shore of Kauai. Most of the Na Pali Coast is inaccessible and the only way to see it is by boat or a helicopter. If you cannot take a helicopter tour, you must see the beautiful coastline with a boat. Check out my full post on the Na Pali Coast. The Secret Beach as the name suggests, is a very secluded beach located on the North Shore between the Kilauea Lighthouse and the Kalihiwai Valley. The beach is not easily accessible as there are no public roads leading directly to the beach. You need to hike downhill for about 10 minutes in good weather to arrive at the beach. The pristine beauty and the seclusion of the beach promise a wonderful respite to those seeking silence and rest on their holiday. Activities include surfing, snorkeling, fishing and sunbathing, however there are no facilities at the beach. Check out my full posts on Sunrise at Secret Beach, Secret Beach Waterfalls and Swimming in a Tide Pool at Secret Beach. Located on the North Shore past Kilauea town, Anini Beach is famous for swimming, snorkeling, windsurfing, fishing and camping. It is equipped with restrooms, showers, pavilions, picnic tables and BBQ grills. The beach also offers great views of the coral reef that ring the island. Check out my full post on Anini Beach. There are only two waterfalls in Kauai, that you can actually drive up to-the Opaeka'a Falls and the Wailua Falls. Wailua Falls were also featured in the opening scene of the TV show 'Fantasy Island'. They are about 85 ft. high and drop into a pool which is about 30 ft. deep. I first saw the beautiful Wailua Falls from the doors-off helicopter tour that I took of the island. The second time I actually hiked to the falls. The downhill hike is steep and can be challenging especially in rainy weather when the ground gets really muddy. Locals have hung ropes to help you hike down. You must take care to dress appropriately and wear good walking shoes. Check out my full posts on Wailua Falls and Wailua Falls Trail. The Wailua Lake (or reservoir) is located off Kuamoo Road above the city of Wailua in Kauai. Activites at this lake include fishing, kayaking and stand up paddle boarding. The lake also has a short pier. It's a great place to have a quiet picnic and spend a restful time even during the peak tourist season in Kauai! Check out my full post on Wailua Lake. 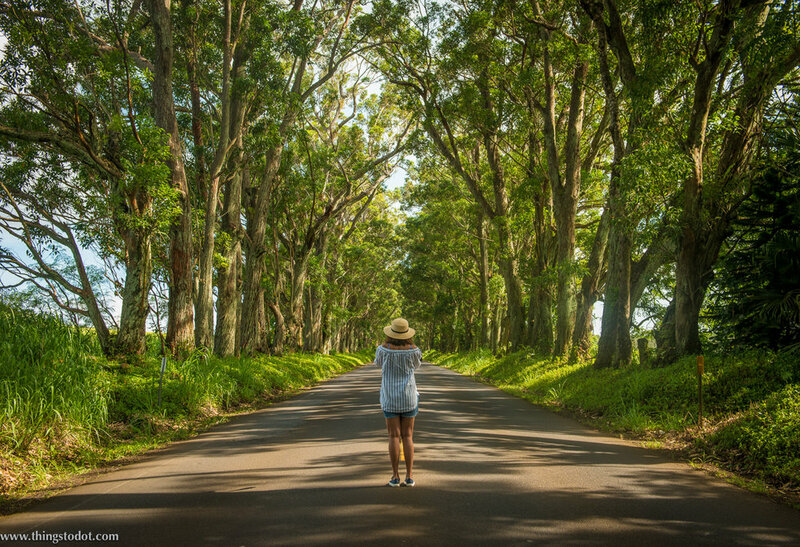 The Tree Tunnel in Kauai is a magical tunnel of Eucalyptus trees that line the Maliuhi Road just off Highway 50 on the South Shore of the island. It is also the way to go to the Old Koloa Town and Poipu. Tourists need to exercise caution while taking pictures in the Tree Tunnel as it is a very busy road. Never stop in the middle of the road to take pictures! There have been tragic accidents in the tunnel. There is a place at the very beginning and also at the very end of the tunnel where you can pull off to take pictures. Check out my full post on the Tree Tunnel. Located on the South Shore of Kauai in Kalaheo, the Kauai Coffee Company is the largest coffee plantation in the U.S.A. About 4 million coffee trees are cultivated over 3,100 acres of land producing 25 different kinds of coffee including a variety of flavors like vanilla, chocolate and macadamia. If you like coffee, then a visit to the plantation is a must. It is also free! Check out my full post on Kauai Coffee Company. Check out my full post on Waimea Canyon Lookout & Koke'e Museum. 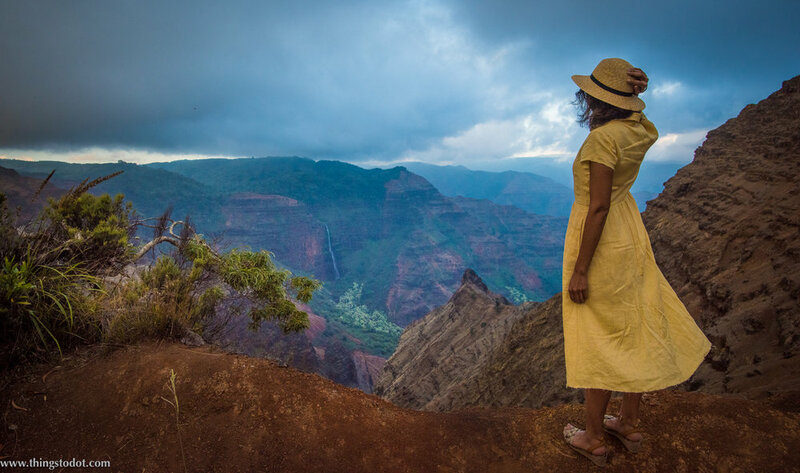 Located on the 18 mile marker on the Kokee Road, the Kalalau Lookout offers amazing views of the Na Pali Coast, Kalalau Valley and the ocean. However, please check the weather before planning to drive here. Views are best on clear days. Check out my full post on Kalalau Lookout. With stunning views of the Na Pali Coast, Ke'e Beach is not only one of the most spectacular beaches in Kauai but also the most popular. It is located at the end of the North Shore and is the farthest you can drive up on Highway 56. It is also one of the best beaches for snorkeling. The famous Kalalau Trail also begins here. However, there are strong currents especially in the winter when swimming becomes risky. Check out my full post on Ke'e Beach. Kalalau Trail, Kauai, Hawaii. Photo: Patrick Kelley, www.pk-worldwide.com. Image©www.pk-worldwide.com. The Kalalau Trail is an 11 mile trail along the Na Pali Coast. The trail which is a part of the Hawaii State Parks system, leads from the Ke'e Beach to the Kalalau Beach. The trail covers five valleys dropping to sea level at Hanakapi’ai and Kalalau beaches. It is a natural wonder. If you enjoy hiking, this is a must-do in Kauai. Check out my full post on Kalalau Trail. Tunnels Beach, Kauai, Hawaii. Photo: Patrick Kelley, www.pk-worldwide.com. Image©www.pk-worldwide.com. Located on the North Shore of Kauai, Tunnels Beach or Makua Beach is famous for snorkeling and scuba diving. Lush green forests and mountains along the beach, give it a picture perfect landscape. The name 'Tunnels' comes from the various underwater lava tube formations found here. Check out my full post on Tunnels Beach. Loop Road is a dirt road that takes you in the interior of Kauai past the Jurassic Park entrance gates. Take Kuamo'o Road all the way to the very end where you will find a spillway - a small stream flowing over the road. This area is called the Keahua Forestry Arboretum. Recently, a bridge has been built for safe crossing in this highly used area and also so that people can access the Keahua Arboretum even when the stream is full. You can also stop at the Wailua Beach and the Opaeka'a Falls on your way to the Loop Road. Just across the spillway on your left are the famous Rainbow Eucalyptus Trees. You can stop here for a picnic lunch. There is a walking trail (about a mile) through the trees. The road becomes a dirt road after the spillway at the Arboretum. You will need a good four wheel drive for the dirt road as it is filled with many potholes and mud. Check out my full post on Loop Road, Keahua Arboretum & Rainbow Eucalyptus Trees. Located on the Opaeka’a Stream in Wailua River State Park, the Opaeka'a Falls are one of the only two waterfalls in Kauai where you can drive up to (the second one are the Wailua Falls). 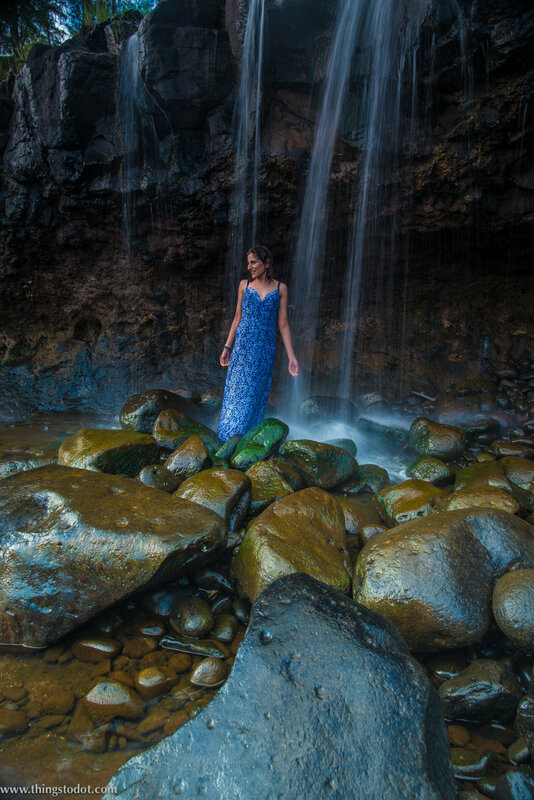 The 150 foot waterfalls are located near the towns of Kapaa and Lihue in Kauai, and you can stop here and the Wailua Beach while driving up to the Loop Road or the Keahua Forestry Arboretum. You can view these waterfalls only from a distance. Check out my full post on the Opaeka'a Falls. The Kilauea Lighthouse is a 52 feet tall structure built on a bluff overlooking the Pacific Ocean. It is also a bird sanctuary. It was seen in Disney's animated film Lilo & Stitch and its sequel, Stitch! The Movie. It is located on the North Shore of the island of Kauai at the Kilauea Point in the Kilauea Point National Wildlife Refuge. Check out my full post on the Kilauea Lighthouse. Lave tube caves, Na Pali Coast, Kauai, Hawaii. Photo: Mallory Roe, www.malloryroephoto.com. Image©Mallory Roe. Lava Tube Caves are one of the most amazing phenomena in nature. In Kauai, there are several lava tube caves along the Na Pali Coast. If you are very fit, you can access them with a kayak tour. Otherwise, you can take a catamaran or an inflatable speed boat tour along the coastline. Blue Dolphin and Captain Andy's run regular tours here. Spouting Horn in Poipu is another great place to see a lava tube cave. Pressure from the ocean water spouts water through an old lava tube. Check out my full post on Lava Tube Caves. Botanical Gardens, Kauai, Hawaii. Photo: Patrick Kelley, www.pk-worldwide.com. Image©www.pk-worldwide.com. Kauai, Hawaii. Photo: Patrick Kelley, www.pk-worldwide.com. Image©www.pk-worldwide.com. There are three National Tropical Botanical Gardens in Kauai in Hawaii: the Allerton Garden, the McBryde Garden and the Limahuli Garden. Each of the three gardens is home to unique flora and fauna including some very rare and endangered plant and animal species. The Allerton Garden is home to lush rainforest, bamboo and tropical fruit trees, the McBryde Garden has a veritable collection of tropical fauna, whereas the Limahuli Garden is a botanical preserve for endangered plants and birds. Check out my full post on the Botanical Gardens. Hanalei Pier, Kauai, Hawaii. Photo: Patrick Kelley, www.pk-worldwide.com. Image©www.pk-worldwide.com. Hanalei Bay is the largest bay on Kauai's North Shore. The town of Hanalei is at the midpoint of the bay. It consists of long stretches of sandy beaches (almost two miles) and the bay itself is surrounded by mountains. Hanalei Pier is a pier built into the Hanalei Bay and fronts Black Pot Beach Park, a popular area for local gatherings and camping for local families. It is a great spot for night photography especially for shooting the Milky Way! Check out my full post on Hanalei Bay. The Lydgate Beach State Park is one of the best family beaches in Kauai. It has two swimming areas enclosed by rocks that block off ocean waves. However, the fish still find a way to get in through the crevices making it the perfect beach for snorkeling, especially if you are a beginner. Check out my full post on Lydgate Beach State Park.